Great value with a reputable company. I'm a little confused by the 7 and 8 round magazines. Is this 7 or 8? Is it sort of a one magazine is 7 rounds flush fit and one is 8 rounds extended? BEST ANSWER: Pistol includes two black carbon steel magazines with witness holes but no manufacturer markings, one is standard 7rd that is flush with the frame and one is 8rd with a polymer baseplate that extends as shown in photo. 7 and 8 round magazines exist both with an extension and flush fit. 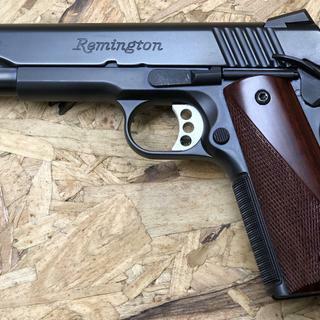 Colt makes flush fit 8 rounders. Remington's 8 rounders have a small basepad extending from the body. Mine came with 2 8 rounders. They are the nicest 8 rounders that don't say "Wilson Combat" I hope this helps. It comes with one flush-fit 7 round magazine and one 8 round magazine that has a plastic bottom. Could not be more pleased with the pistol. Tight fit and a great trigger. This was my first .45, and I was thoroughly impressed after shooting it for the first time. It took some time (about 2 magazines) to get comfortable and find the “sweet spot”, but once you get going it’s an excellent piece. One minor lock-up about 45 rounds in but after that is was smooth sailing. Easy to take apart and clean as well. Couldnt be more satisfied with a purchase. I absolutely love my R1 carry. It comes with me everywhere that is legal to carry. I love this gun so much I picked up reloading to get more trigger time behind it. Mine was made in Ilion, NY. Very good fit and finish. 3 malfunctions in first 300 rounds, zero after 800 additional rounds. Wilson 47d + Winchester PDX1 for EDC. I have several guns and will buy more but this one will always be my favorite. Get rear night sights and G10 grips, you may get hooked. I carry this over my Glock. The 1911 R1 Carry line has a checkered front strap for a more positive grip and Novak tritium front night sight so your aim stays sure in moments of duress. Also features an ambidextrous safety, a machined skeletonized aluminum trigger.